In addition to our daily advent fun, I have been doing some more, shall we say, challenging cooking. I have not been in the mood to make cookies so we bought a candy thermometer, some good melting chocolate, corn syrup, heavy cream…all the things you would only get away with buying at this time of year. 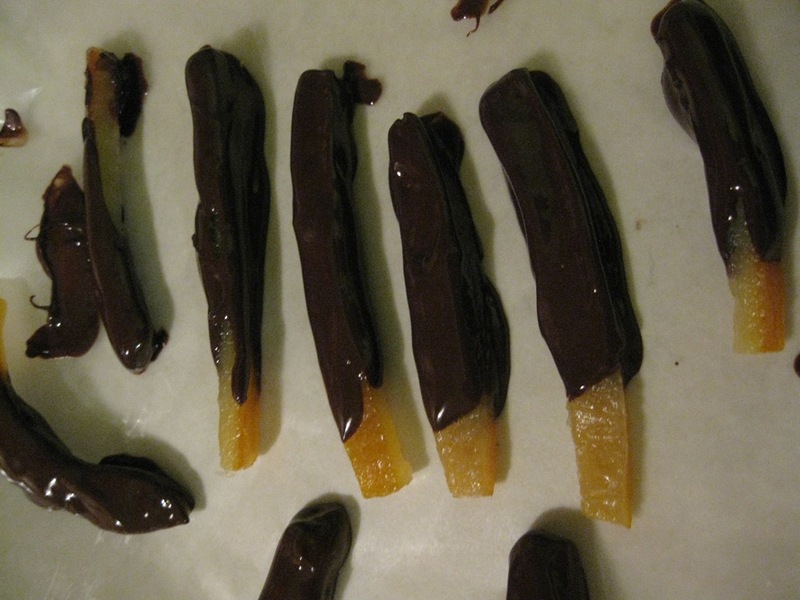 First up, chocolate dipped candied orange peel. The verdict: not really that hard, though fairly time consuming. It took a morning to do the peel, then after the kids were in bed at night, I did the dipping in chocolate. But the ingredients were few and the active work involved was pretty minimal. The results were very tasty! 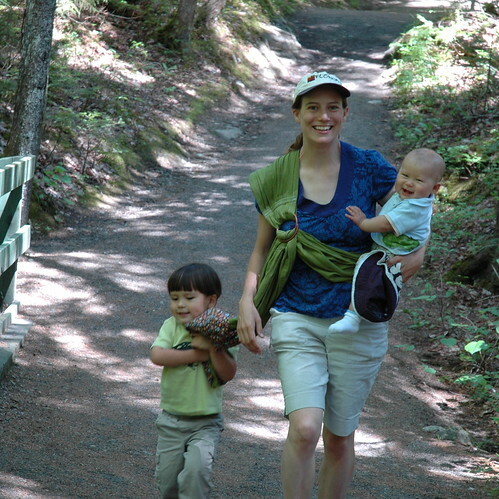 Next, making marshmallows (with BB). The verdict: the only hard part was getting the thermometer in the liquid. The liquid was not deep and my pot was too small to clip it on, so I had to rig a stand for the thermometer. Other than that, the mixer does all the work, so I would say it was a piece of cake. 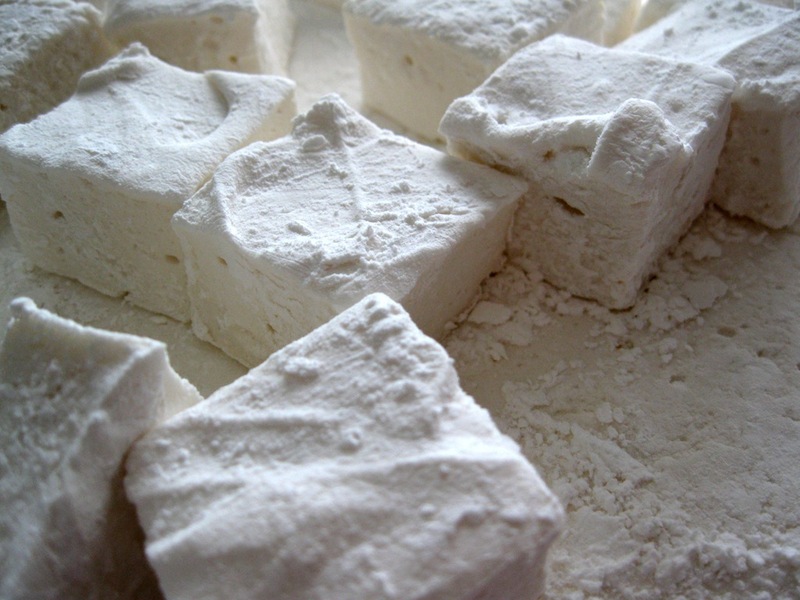 BB is loving the marshmallows, and I made them with the thought of giving them along with hot chocolate on a stick to his teachers. It made quite a bit, so I think we’ll have enough. They are tasty, but I don’t see that they are that much different from the store bought kind. No artificial colors or flavors though, so that’s a perk. I would do it again. 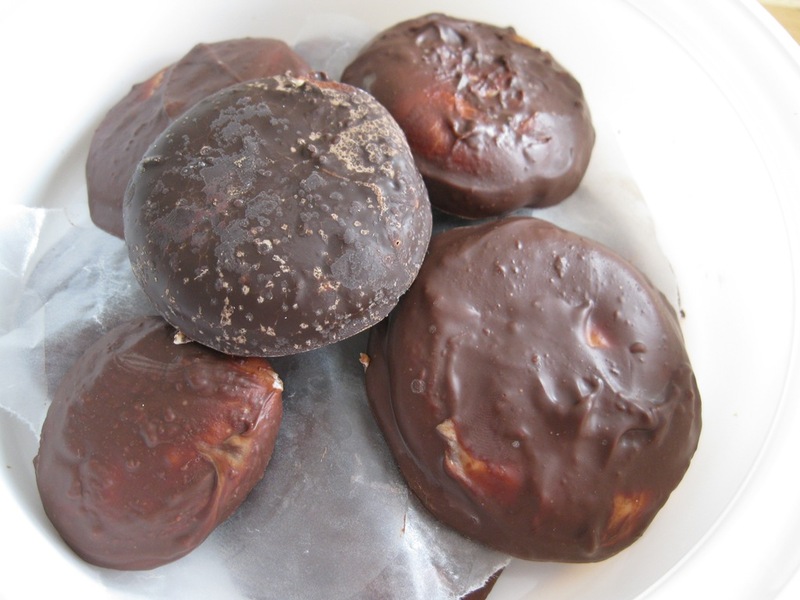 Next, I saw these homemade peppermint patties and decided to try them, because we had a bunch of sweetened condensed milk that I don’t know what to do with. The verdict: well, this is my fault. I had mint extract, not peppermint extract, and it came out OK, but not great. Really tricky. I froze the patties for about 10 minutes and once I dipped them in chocolate they got all melty. Most of the first batch was a total mess. Once they sat overnight though, they hardened up pretty well. I did a second batch later, and I made the patties thicker and froze them for 30 minutes. This time I also used chocolate chips, as stated in the recipe (the first time I used the nice Swiss melting chocolate I had). I thought the dark chocolate from the first batch looked and tasted better (the one in the middle is from the first batch). If you’re going to go to the trouble to make candy, you might as well use good stuff. Lots of work though. I think it would be easier next time, and I would consider doing it next year, maybe with BB (I did them alone, it was definitely too hard for a young child to help with), and I would buy peppermint extract for it. 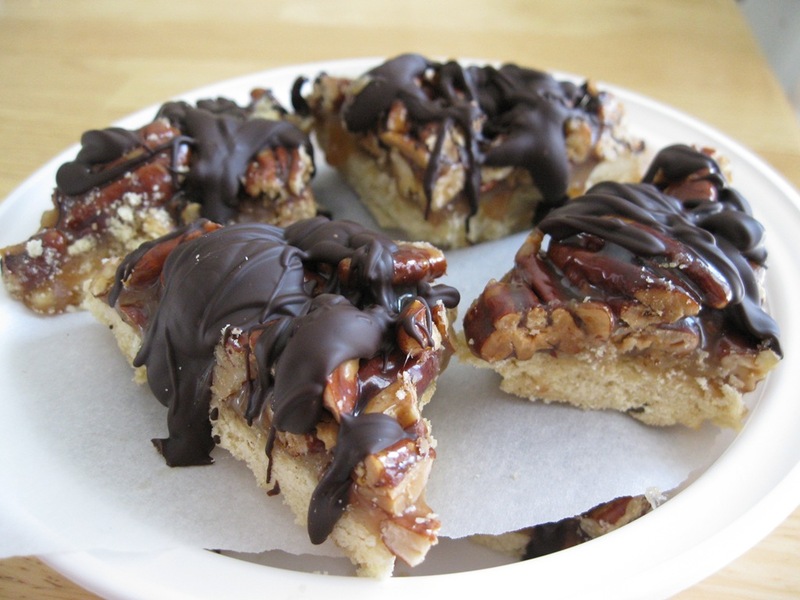 And finally, on that page there was a link to these chocolate dipped caramel pecan bars…drool! It’s all my favorite things; how could I not make them?!? The verdict: these were about a thousand times harder and more time consuming than they looked. I made the cookie crust; pretty straightforward. Then I started the caramel, and the instructions were a little vague. So if you think of doing this, let me advise you to google “how to make caramel” FIRST. Alton Brown had some info, as did some other good sites. It is fascinating, terrifying, and a miracle of calorie density. I cooked 1 cup of corn syrup, 1 cup of sugar, 1/2 cup water and 1 cup of cream and I swear I got 1 cup of caramel. Amazing; the laws of physics do not apply to making caramel! No, really, you just get rid of all the water leaving only sugar and fat, it truly must be the most calorie dense thing I have ever made. I question the need to start out with 1/2 cup of water and if I were crazy enough to try this again, I would look elsewhere for the caramel recipe. So, when all was said and done, I went to cut the bars and they were STUCK in the pan like nothing you can imagine. Most of them came out in pieces and only with patient chiseling did I get any out intact. The caramel is not very firm, so it kind of oozed out as I tried to cut and extract them. Needless to say, with a crumbling crust and an oozing top, I could not dip them in the chocolate because they just fell apart. So I refrigerated them some more and drizzled the chocolate on top and refrigerated them again. At room temperature I can say they are very messy. My lucky children did get some of these in the end and it took awhile to get them unstickied. That’s my holiday kitchen adventures; later I will post more of our advent activities!